To all mothers, a couple of pretty flowers today. 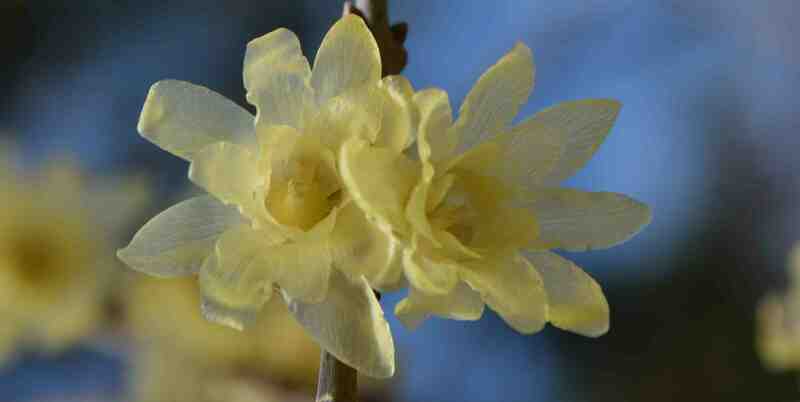 Above is the pure yellow (‘Concolor’) form of wintersweet (Chimonanthus praecox). I have posted about this before but that was the common form with red staining on the inner petals. This form is, to my eyes, much more beautiful although this is a shrub to plant for its fragrance rather than its looks. This is a bit of a one-trick-pony in the garden, looking drab when in leaf and boring in winter, but when those spicily scented flowers open those other 11 months are forgotten. Below is Prunus ‘Okame’, a less well known cousin of the now ubiquitous and deservedly popular P. incisa ‘Kojo-no-Mai’. ‘Okame’ has Prunus incisa as one parent and was raised in 1947 by the cherry expert Collingwood Ingram. It is a small tree, to about 6m high and wide and deserves a place in the garden for its rich pink spring blossom. And now for something completely different: a cycad. So far I have omitted these from this blog because they are slow growing, some are rare and none are hardy. The most common is Cycas revoluta, a Japanese species that is commonly sold as a houseplant in the UK and Ireland. 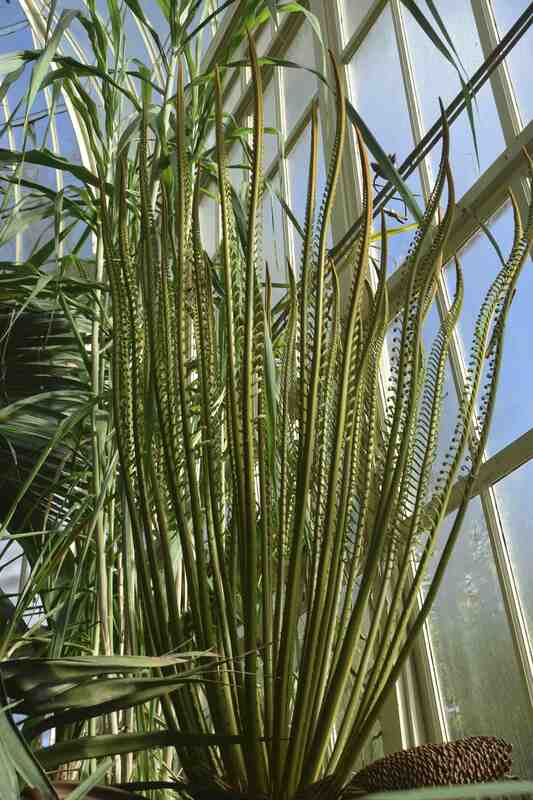 It is a tough and resilient plant that is a good choice for a sunny windowsill or conservatory. Cycads are amazing plants and relics of the time when dinosaurs romped across the world chasing Raquel Welch. They are primitive and evolved before the flowering plants appeared that fill our gardens today and they are precursors of the conifers. They have pinnate, leathery leaves, usually form thick trunks and have either male or female cones. They were once very abundant across the globe but are now restricted to subtropical and tropical regions and are rare in many countries, having been cleared for agriculture, harvested for food (starch) or for horticulture. They can live for hundreds of years and the oldest potted plant in the world is a cycad, Encephalartos altensteinii, collected in 1770 from South Africa, now growing in the Palm House at Kew. 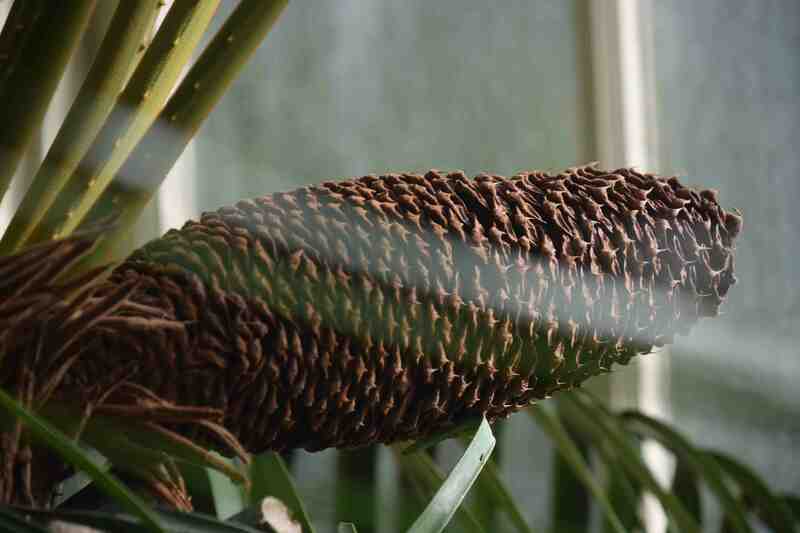 Cycads, as a group, have hardly changed since the Jurassic period, according to fossil records, and they date to 280m years ago although currently extant species are no more than 12 million years old – still quite an age! I first grew cycads when I was a student, purchasing seeds from Chiltern Seeds and germinating them in a propagator that involved a fruit box, foil and a light bulb, in my bed sit. Seedlings grow very slowly and only produce a single leaf in the first year. When mature the leaves can be many metres in length, in a crown on a single stem that makes them resemble palms. The common Cycas revoluta is called the sago palm and the pith from the trunk is used to produce sago. It is probably the world’s most common cycad and is tolerant of light frost. But all this preamble is to introduce some photos I took last weekend at Dublin Botanics of Cycas thouarsi, a Madagascan (and east African) cycad that can reach 9m high in the wild and produces horizontal cones about 60cm long and a flush of new foliage in spring. I was bewitched by the new fronds on the plant, made more significant by the old leaves having been removed. Each leaf can be 2m long with 70 pairs of leaflets and what attracted my attention was the way that every leaflet was intricately curled. The flush of new foliage can contain as many as 40 leaves so this is a very striking plant. It is named after Louis-Marie Aubert Petit-Thours (1758-1831) who was a botanist working in Africa who found the species in 1804. They misidentified the plant as Cycas circinalis, a similar looking species. It is thought to be one of the most ancient of all cycads. Maybe I am being fanciful but those new leaves seem to be waving in the air like some gigantic squid! If you are lucky enough to buy one, or get seeds, it is said to be one of the quicker growing species, grows best in sun or light shade and it is said to tolerate short and light frosts. It needs perfect drainage and overwatering will kill it. My little cycad seedlings were all lost through various reasons such as moving around with jobs and, most probably, cold when I lived in a house with virtually no heating! all I can say is WOW what a plant now we all want one . Showing my age a little there! As the youth of today would say, that Cycad looks wicked.